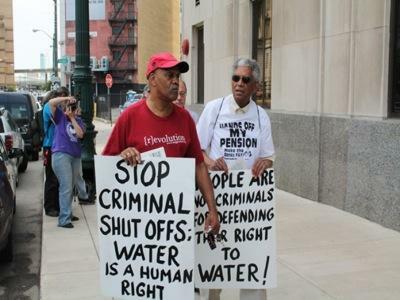 Thousands more Detroit families had their water shut off this week as part of the city administration’s plan to cut service to 150,000 households who are overdue on their water bills. Emergency Manager Kevyn Orr said he hopes to shut off water service to as many as 3,000 homes per week this summer. A World Socialist Web Site reporting team visited a bill payment center Monday, where residents can attempt to get their service reinstated after paying what they owe, plus a $30 fee. We encountered enormous opposition to the shutoffs. Several residents reported that they were shut off with no notice, leaving their families completely unprepared. Others said they lost water service due to mistakes on the part of the water department and hadn’t actually missed a payment, but even after confirming this, were still required to pay the fee to restore service. “I’m retired, and I’m sick with cancer,” said Renella. “To shut off someone with no warning is terrible!” said Andre Hill, a welder and father of six whose family’s water was shut off with no notice. Andre said he opposed the bankruptcy of Detroit, in particular the private takeover of the Detroit Institute of Arts. “It’s not fair,” said Anthony, a disabled veteran. “Freddie Mac and Fannie Mae and all those companies, they got found guilty of doing wrong. They get on TV and do their little speeches and that’s that—they’re not held responsible for anything.